He became the second fastest batsman to reach 24 Test hundreds. Virat Kohli has been in sublime form and he is called India’s run-machine for some reason. He led from the front in England and even he knew that it was a mandatory thing about him scoring a ton again Windies and that too at home. 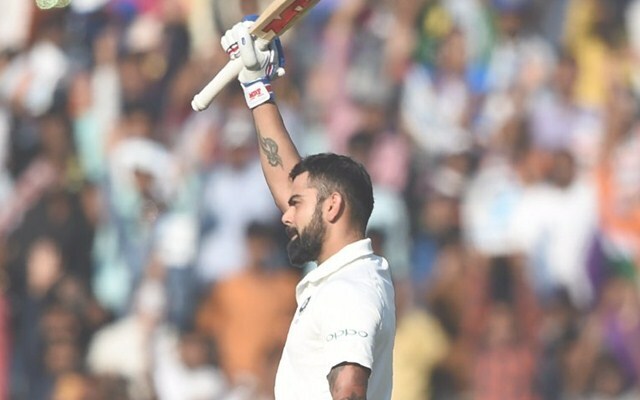 The Indian captain didn’t even break a sweat on a sultry morning in Rajkot as he went past the three-figure mark for the 24th time in his Test career. Throughout the England series, Kohli had to come to the crease very early thanks to the poor show from the openers. But this time, the platform was nicely set courtesy a stunning debut of Prithvi Shaw. He came in to bat with India’s score reading 209/2 and there was no doubt about the fact he wasn’t going throw away his chance. The only worrying moment for the hosts during their innings came on the first day when Shaw got out. However, Kohli joined hands with Ajinkya Rahane then to rebuild the innings for close to 30 overs and didn’t play any bad or extraordinary shot and just went through the process rotating the strike. He punished the odd bad balls and without any fuss reached 72 by the close of play. On the second morning, Windies were expected to make it tough for India to score. But in contrast, they easily let them off the hook with Rishabh Pant attacking and Kohli giving him more strike. The visitors were just for them to make a mistake and Virat Kohli is not a batsman who will give his wicket away easily. He completed his 3000 Test runs at home with a classical cover-drive and again went into the shell. He calmly continued to play his way despite his partner going berserk from the other end. There was no blip in concentration for even a second and Kohli just walked past the 100-run mark by hitting a boundary of the harmless down the leg-side delivery. There were no animated celebrations from him also as he knew that he was expected to score it. The fact that he scored only six fours on his way to century proves how much he values his wicket in Test cricket. Meanwhile, Twitterati was once again busy praising the Indian captain for such a sublime knock and hoped that he notches up his seventh double-century. Kohli century. Inevitable. Scoreboard inevitable too. Virat Kohli hits his 7th boundary to get to his 24th ton in test cricket. After the Shaw show yesterday we are now treated to the @imVkohli show. Centuries are inevitable for the Indian Captain. Kudos!